So cutting out sweet treats from my life would have made life...well...pretty sad me thinks. I figured if I want to enjoy good health, I'd have to find a way to curb the sugar without total self deprivation. My epic hunt for healthier alternatives began. But don’t be fooled! Just because there’s natural sugars out there, doesn’t mean you should go overboard and binge. Sugar, whether natural or refined should only be consumed in moderation. The difference here is that natural sugars have nutritional value and benefits, unlike the refined kind which increases inflammation in the body, which can lead to illness and disease. This is where these chocolate fudge energy balls come in, and I'm super proud of them! 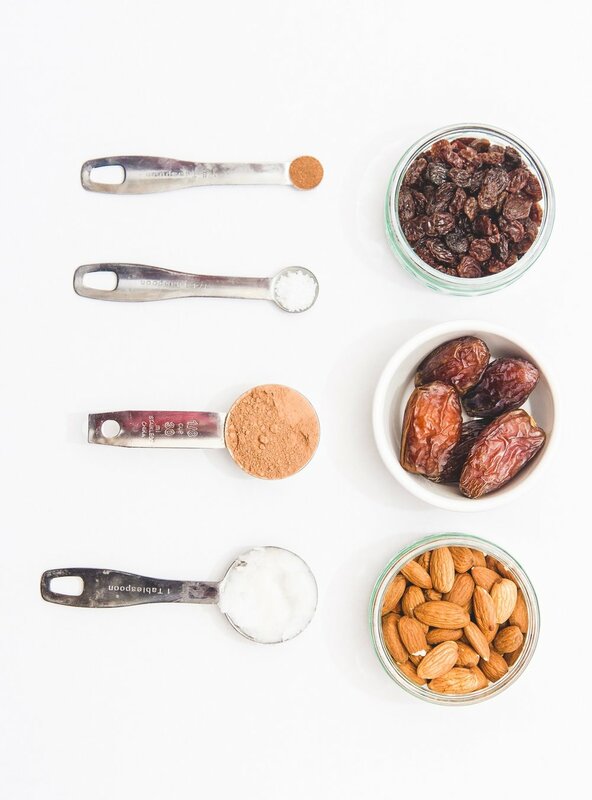 This recipe was actually my first ever attempt at making a healthy sweet treat. And every time I make them I just remember the excitement of me starting this blog and recipe creating for the first time. And let me tell you girls, these energy balls are GOALS. They are fudgy, gooey, decadent, nutritious, quick and they don’t even need any baking! The almonds balance out the sweetness of the raisins and dates really well, and make this treat surprisingly filling. You just can't binge on these. It's not possible. You'll end up in a coma. It's also great because the sugars from the raisins and dates are combined with a whole lotta of fibre and healthy fats, meaning your blood sugar levels won’t have a roller coaster ride. All ya gotta do is chuck all the ingredients in a food processor and whizz ‘em up and then roll them into balls. Honestly, it takes 10 mins tops. AANNDD most importantly, it's kid friendly too! My babies love them and they really enjoy making them with me in the kitchen. It's such a fun way to spend time with them (not including the amount of fights I have to break up over who gets to switch on the food processor). They are also a fantastic way to introduce your ‘healthy food is yummy’ sceptic family and friends as they don’t taste ‘healthy’, they really taste indulgent and are made of 100% raw and natural ingredients! By the way, if you need help convincing your family members or friends who are healthy food sceptics to eat more wholesome meals, I wrote a blog post addressing some of the issues they may be facing which you can check out here. 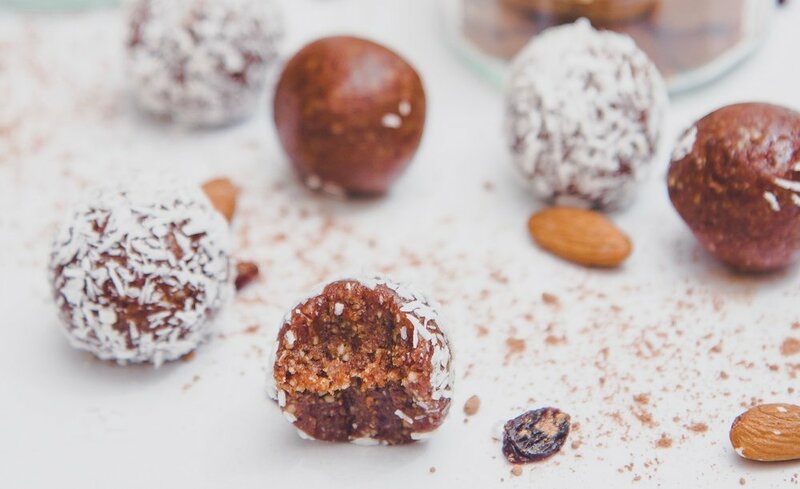 Have you ever tried energy balls before? Let me know if you’re gonna be making these bad boys by adding #EarthNSpoon to your pics on Instagram. I’d love to see your creations! Lez do this shall we? Place almonds and sea salt in the food processor and blitz until crushed well. Chuck everything else (except desiccated coconut) in the food processor and blend until the texture is sticky like fudge and holds together. Grab a handful of the fudge and roll into balls. Chill in the fridge until ready to serve. (Allow them to sit out for 15 mins before serving as they can be rock hard when cold!). * I chose to cover half of the balls in coconut for variety and to make them look pretty. If you want to make it super kid friendly, you may wanna skip this step. Dates - rich in dietary fibre and a great source of iron. They also contain vitamin A to protect your eyes, vitamin K to coagulate blood and increase bone density. Raisins - these bursts of energy are concentrated sources of vitamins and minerals. Some of their benefits aiding digestion, lowering blood pressure and reducing the risk of a stroke. Almonds - an excellent source of vitamin E & protein as well as a good source of potassium, magnesium & manganese. Almonds help lower cholesterol and contain protective antioxidants. Raw Cacao - high in antioxidants that combat free radicals in your body which can help prevent disease in your body. Coconut oil - the multi-chain fatty acids (MCFAs) contained in coconut oil are mainly responsible for all their health benefits such as helping to prevent heart disease, high blood pressure, cancer, alzheimer's and UTIs to name a few. It is also an antibacterial, antifungal and antiviral. Cinnamon - a powerful medicinal spice as well as an antioxidant, antimicrobial, antidiabetic & an anti-inflammatory.